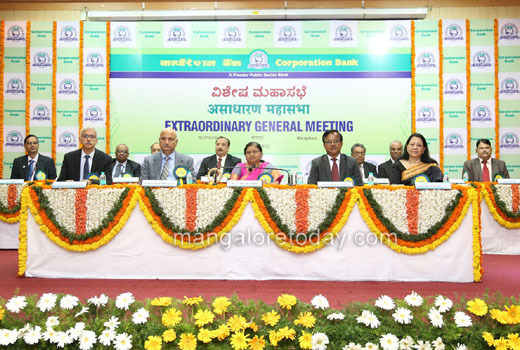 Mangaluru, Mar 27, 2019 : Corporation Bank held an Extraordinary General Meeting (EGM) of its Shareholders at the Bank’s Head Office, Mangaluru on 27th March, 2019. Smt. P V Bharathi, Managing Director & Chief Executive Officer of the Bank chaired the meeting. During the EGM, the shareholders approved to issue 3,40,55,47,226 equity shares of face value of Rs.2 each of the Bank at an issue price of Rs.26.68 per share amounting up to Rs.9,086 crores to the Government of India on preferential basis. Smt. P V Bharathi, Managing Director & CEO of the Bank addressing the Shareholders on the occasion of Extraordinary General Meeting of Corporation Bank held at Head Office of the Bank at Mangaluru. Also seen in the photograph are Shri Gopal Murli Bhagat and Shri Birupaksha Mishra, Executive Directors, as well as Ms Chitra Gouri Lal and Shri Deverakonda Diptivilasa, Directors on the Board, General Managers and the Company Secretary of the Bank.